For those not in the know, these printers work by extruding hot plastic in layers. They’re similar to those special pens you used to use in primary school with the raised ink. If you drew over the top of an already-raised section, it could raise even further. You pop one end of a spool of plastic in the machine and feed it down until it hits the gears inside. Then as you’re printing, it pulls down some plastic, heats it up to about 200 degrees C, then shoots it out of the nozzle onto your printing platform. Very neat indeed. 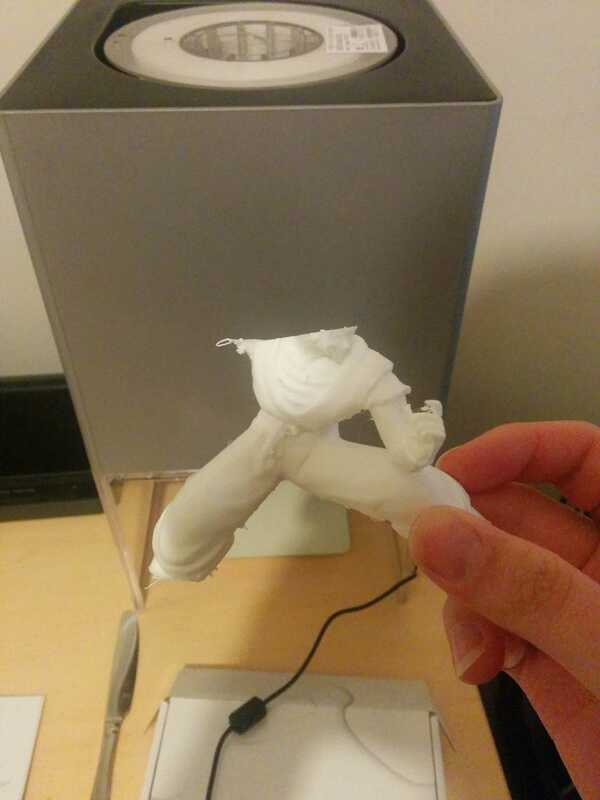 I set up the printer last night and tried to print something. The printer itself is quite nice to look at, as it’s an elongated cube with a perspex base and a grey top which conceals the internals quite nicely. 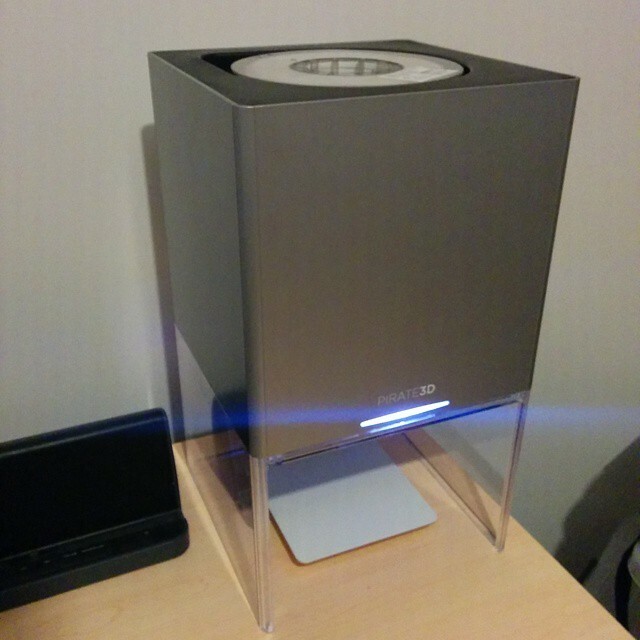 When you print, the print platform rises upwards to just inside the grey case and after some calibration tests (to make sure the nozzle touches the platform) and some heating, the printing starts. It’s a long process (the first print was going to take about 3 hours or so, and my second print was 12+ hours in and barely over 50%), so you can’t just whip up a toy plane for your grandkids while they’re over for an hour after school, but it is simple to print. It’s noisy too — it’s sitting against the wall on my room which backs on to the bedroom and I could hear it whirring all night. Not annoying, but enough for my wife to pop in some earplugs so she could sleep. As it’s printing, the platform lowers, so you can see it emerge from inside. When it’s completely done, the platform moves to the bottom, where you can remove the plate inside and ease off your print. The software is quite easy to use too. There’s an iOS, Android and Windows version available. I just installed the Windows version (as my printer is sitting on my desk to the right of my PC and got set up in a few minutes. The longest part was actually loading the filament in! Then onto the prints. My first print was the Eiffel tower. It got about 15% in (after an hour and a half) and it just stopped. The build platform lowered and that was the end of it. I had a couple of millimetres of plastic down of the four corners and that was it. 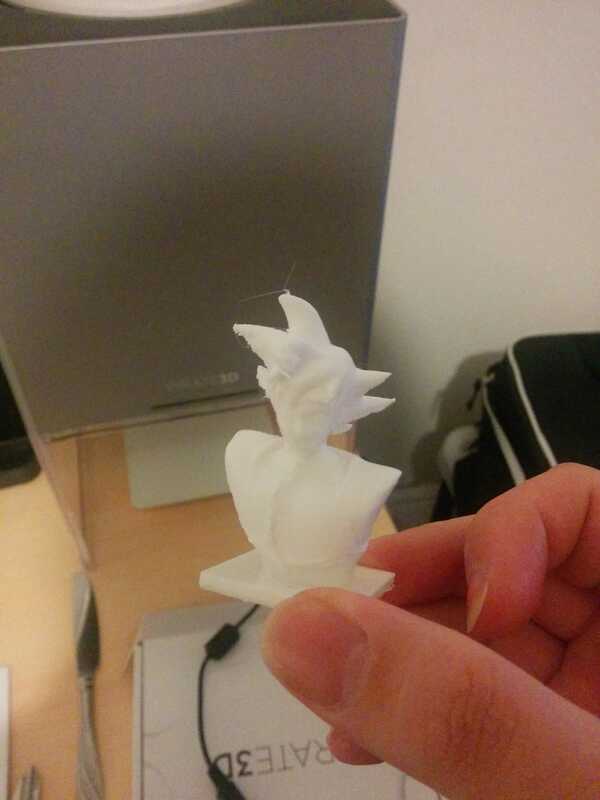 So I scraped it off the sticky build platform (sticky to hold your print down and stop it from warping at the sides as the plastic cools down) and then downloaded this Goku model from Thingiverse. I left the build size at 100% (which took up a fair chunk of the build platform) but didn’t realise just how long it was going to take. I also turned on “supports”, which are extra bits printed to support overhanging areas (so an arm sticking out or a torso only attached by two small legs can be propped up to avoid it breaking off). 14+ hours later, I think it’s done (I’m at work, so no way to check See the update in the paragraph below!). Both feet have fallen off (as they didn’t have enough plastic holding them on to the leg, so they “snapped off”) and I’m sure it’s used a fair whack of plastic, but if it comes out well, it should look good. I’ve had my camera sitting next to it, taking a photo every two minutes, so I should also have a very nice timelapse when I return. 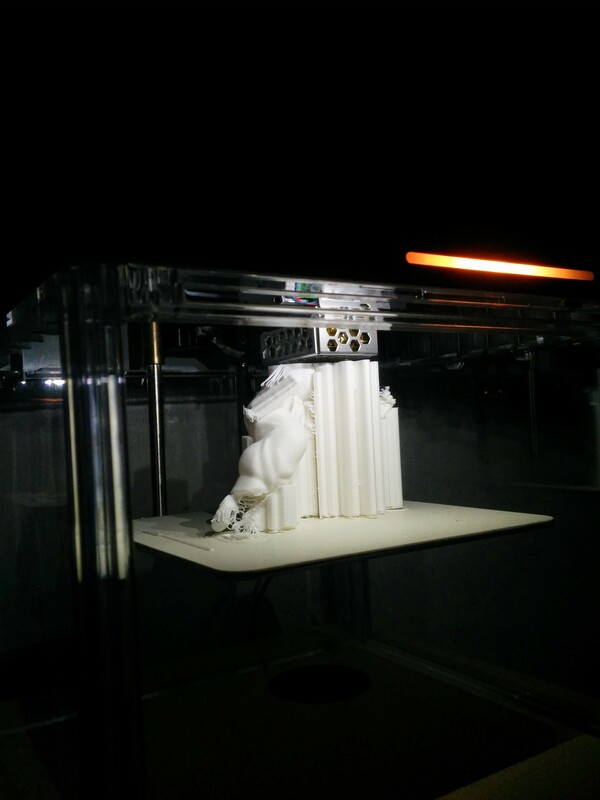 For now, here’s photo and a video of the printer in action. You can see Goku’s leg on the left, and his missing foot just below that. I don’t know how successful this print will be.